A popular local vicar has been banned from driving for two years, after hitting another car whilst three-and-half times the drink- drive limit. The Rev Paul Sanderson, who became vicar of Worsthorne and Cliviger in 2016, had intended to travel about 13 miles, but had pulled into a car park in Whalley when he realised he wasn't fit to be behind the wheel. Burnley Magistrates' Court was told the clergymen suffered from post -traumatic stress disorder and had been drinking to self-medicate. The 50-year-old blew 127 microgrammes of alcohol in 100 millilitres of breath at the roadside and then 118 microgrammes at the police station after he was arrested. The legal limit is 35. Sanderson, a former hospital chaplain, became parish priest at the churches of St John the Evangelist in Worsthorne and St John the Divine in Cliviger, two years ago. At the time of the collision, the ex- Catholic priest lived at St John's Vicarage in Worsthorne. The defendant, a married stepfather-of-two, is said to be currently "off sick." 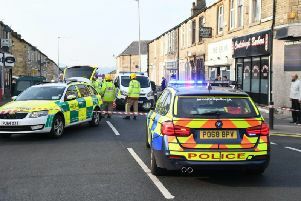 Prosecutor Miss Sarah Cook told the court that as a motorist went onto the car park of the Co-op in the centre of Whalley, at about 7pm, she felt the defendant's car bump hers. Miss Cook said: " She saw Mr Sanderson in the driver's seat. She went to a nearby relative's house to phone her husband. "When she returned to the car park she found the police were in attendance. " Mr Daniel Frazer, defending Sanderson, said he had intended to drive to Worsthorne. The solicitor continued:"He rapidly realised that wasn't going to be achievable and then pulled up. " Mr Frazer said the defendant, "a man of exemplary character," had been diagnosed with PTSD. He added: " He says he drank to deal with that situation." Probation officer Mr Elliot Smith, who interviewed Sanderson, told the hearing the defendant had started receiving treatment in relation to his PTSD and was having counselling. Sanderson, who moved to Chorley about two weeks ago, admitted driving on Accrington Road, Whalley, with excess alcohol, on June 19th. He was given 140 hours unpaid work and must pay £85 costs and an £85 victim surcharge. The defendant had no previous convictions. Sentencing, District Judge John Maxwell told him:" I'm genuinely sorry to see you here. "It's not a matter I can overlook though."